Fred Rosenbaum grew up in North Beach, and loved Coit Tower’s historic WPA paintings. 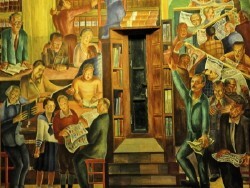 Among these is Bernard Zakheim’s “Library,” which shows workers reading books and newspapers. Fifty years later, Rosenbaum was working on his outstanding book, Cosmopolitans: A Social and Cultural History of the Jews of the San Francisco Bay Area when he got a phone call from Bernard’s son, Nathan. Zakheim told him that he had a warehouse in Los Angeles containing 1500 original artworks by his father, and asked Rosenbaum if he would be interested in seeing them. Rosenbaum knew of Bernard Zakheim (1896-1985) from his book research, had a trip to Los Angeles planned, and decided to take Nathan up on his offer. The result? The first public exposure of many of the works of one of San Francisco’s greatest but largely forgotten activist and Jewish artists. And most fitting of all, this exposure is now taking place at the Jazz Heritage Center in the Fillmore, the neighborhood where Zakheim lived and painted his greatest works, and whose surrounding Jewish community came as close as possible to replicating his early years in Poland. Bernard Zakheim was one of the key founders of the San Francisco Artists and Writers Union in 1933, and associated with many of the prominent artists who comprised the legendary California Labor School at 240 Golden Gate Avenue in the Uptown Tenderloin (for the best account of the School, see Mark Dean Johnson’s At Work: The Art of California Labor). Zakheim was among the very first artists to portray the evils of the Holocaust, maintained a lifetime commitment to socialism, and left a body of work that should be widely distributed in prestigious museums across the nation. But while Zakheim’s large public works can be seen at Coit Tower, the SF Jewish Community Center, the SF Art Institute, and in his 1938 murals at UCSF’s Toland Hall, his paintings and other works have been sitting in a warehouse for years. Incredibly, the show “Zakheim: The Art of Prophetic Justice” at the Jazz Heritage Center (“the Center”) is the first opportunity virtually everyone attending will have had to see these great original works of art in person. The Zakheim show includes original paintings at the Jazz Heritage Center’s Lush Life Gallery, and photos and discussion of other works in the Center’s large Koret Center Lobby at the entrance to Yoshi’s. It is unquestionably the most ambitious show in the Center’s history, and is more akin to what visitors expect from SF MOMA or the De Young Museum than from a neighborhood space. Zakheim grew up in an Hasidic family in Poland, and soon got involved with activists seeking to create an independent Polish state. He fought the Germans in World War I and ended up in a POW camp; the exhibition includes a harrowing painting of conditions in such camps that resemble the concentration camps of the next world war. Zakheim then moved to San Francisco, to the thriving Jewish community in San Francisco’s Fillmore District. He became good friends with Diego Rivera, and spent a year with Rivera and Frida Kahlo in Mexico, and experience also reflected in various Mexican-themed paintings. Zakheim then went to Paris, and, foreseeing storm clouds approaching for European Jews, returned to Poland and begged his family to return with him to the United States. He could not persuade them, and among the most emotionally powerful works of the entire exhibition is his 1946 painting of the faces of the four brothers he lost in the Holocaust. Zakheim’s radicalism emerged from his Jewish background and was inextricably linked to his powerful sense of Jewish identity. He was involved in the “First Yiddish Art Exhibition” which was held in the Fillmore at Steiner and Golden Gate Avenue in the early 1930’s. During the 1940’s when he felt that anti-Semitism in the United States was on the rise, he painted a series of remarkable works showing how Jews had helped in the Revolutionary War effort and otherwise were loyal and trustworthy Americans. The war’s conclusion led Zakheim to become one of the first Jewish artists to portray the horrors of the Holocaust. The exhibition includes his painting of Nazi leader Adolph Eichmann, and another notes that 300 members of his family were lost in the Holocaust. He also has a powerful painting of Nazis’ surrounding a religious Jew. Zakheim wanted Jews remaining in Europe to emigrate to Palestine, and another of his best works shows partisan Zionists leading the remnants of European Jewry to the new state of Israel. Zakheim saw Jews as part of the worldwide proletarian movement, with his “Biography of Proletarians” noted above including many Jewish figures and Hebrew writing. Zakheim’s works and this exhibition will be rewarding for people with no interest in San Francisco or Jewish history, but those interested in getting the feel for life for Jews and activists in the city in the 1930’s and 1940’s simply must see the show. For example, how many know that the Fillmore District once housed furniture factories? When Zakheim first arrived in San Francisco in the 1920’s he opened a furniture factory in the Fillmore, and two of his chairs are in the exhibition. When Zakheim submitted a sketch for a pro-union parade float, he wrote on it, “’Bernard Zakheim’ Return to 2193 Fillmore Street.” The exhibition also includes a powerful 1934 painting titled “Waterfront Organizer” which portrays what the title states, as well as Zakheim’s portrait of legendary ILWU leader Harry Bridges. Both instantly recall the flavor of those contentious times on the city’s docks. Rosenbaum, who curated the exhibition with Rosanna Sun, not only was connected to Zakheim because he saw his Coit Tower mural as a boy, but his book on San Francisco’s Jewish history emphasizes the community’s 1930’s and 40’s radicalism. So Rosenbaum was particularly driven to get Zakheim’s works renewed public exposure, and he and Sun have created an exhibition that exceeds all expectations. We owe a thanks to Nathan Zakheim, the curators and the many foundations that funded this exhibition for retrieving a long lost and vital slice of San Francisco’s cultural history. “Zakheim: The Art of Prophetic Justice” holds a public reception on October 20 at 7:00 p.m. and Fred Rosenbaum will speak at 8:00 p.m. The Center is located at 1320/1330 Fillmore Street in San Francisco.